Our next meeting will be held on Monday, March 18, 2019 at 7 pm and will be hosted by John Williams. RSVP to John at john.williams2@gmail.com. We look forward to seeing you and having a sgwrs (chat). Venue: Westminster Presbyterian Church, 470 Roosevelt Ave.
Last year’s Gymanfa was a resounding success. Please join us again to sing some wonderful traditional hymns in English and in Welsh. Please bring your Welsh Hymn Book, if you have one! As always, we invite you to participate in a friendly reception (Te bach) afterwards and we would be very grateful if you could bring some goodies to share. We will once again have the pleasure of celebrating Dydd Gwyl Dewi Sant/St. David’s Day with a luncheon banquet in the gracious surroundings of the Royal Ottawa Golf Club. Please join us to honor our patron saint while enjoying good fellowship and excellent food. Our guest speaker this year is Andrew Wagstaff, Head of Wales at the Montreal office of Llywodraeth Cymru / Welsh Government. Entertainment: A short recital by Sheryl Clay who is coming all the way from Toronto to entertain us as well as conduct the Gymanfa Ganu on Sunday. 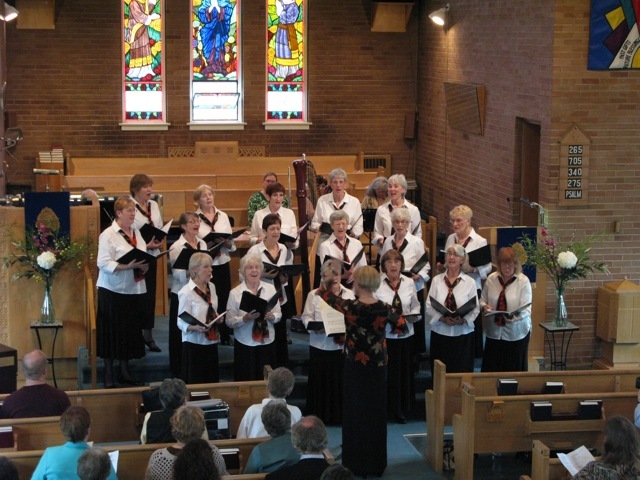 Sheryl is well known to many of you as she has been the soloist at many Ontario Welsh Festivals and is a regular soloist with Dewi Sant Welsh United Church in Toronto. Menu: This year we are offering Beef & Guinness Pie and Salmon Filet. Cost: Early bird tickets $55 each, deadline February 15, 2019; $60 thereafter. Final deadline for reservations is 27 February 2019. Dress code: Business casual – no jeans or cargo pants. Reservation forms will be in the Winter 2019 Newsletter or you can print your own: Luncheon Reservation 2019. Please send your completed forms, with payment, to Marilyn Jenkins, 267 McClellan Road, Nepean, ON, K2H 8N7. If you wish, you may include your 2018 membership form and payment with your luncheon reservation. Please join us in celebrating St David, patron Saint of Wales and enjoy a taste of Wales. RSVP by Wednesday, February 27, 2019 to John Price at john.price@sympatico.ca. Our next meeting will be held on Monday, February 25, 2019 at 7 pm. Note date change. RSVP to Alison Lawson at 613-725-2704 or alisonlawson@rogers.com. Our next meeting will be held on Monday, January 21, 2019 at 7 pm. Our next meeting will be held on Monday, December 10, 2018 at 7 pm. This meeting will combine the regular Awr Sgwrsio with Awr Sgwrsio i Ddysgwyr. Come and celebrate the season with a carol singing party/parti canu carolau – in Welsh, of course. Alan Thomas has agreed to play the piano for us and we will try to sing a few of the better known carols. We will try to read the words first and then sing. I will forward scanned copies in the next few days – any special requests? I will provide egg nog and mulled wine. Chris Smart has already provided a plate of cookies. It would be great if a few others could bring some festive treats to share. I like to ……… at Christmas. Westminster Presbyterian Church, 470 Roosevelt Ave.
We hope to see you there in large numbers for the singing, reading and for the fellowship time in the Hall after the Service. Contributions to and help with the te bach are always gratefully received. 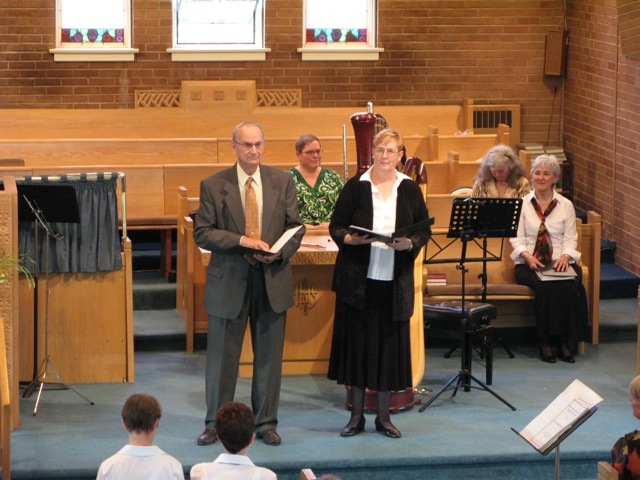 Since it will soon be time to start organizing the service, please feel free to contact John Price at (613)724-3846 or at john.price@sympatico.ca to volunteer your skills as a reader or to suggest a new hymn we might sing. Enjoy Welsh Christmas music and help support the Celtic Chair at University of Ottawa. The Ottawa Welsh Society’s Awr Sgwrsio i Ddysgwyr (conversation group for Welsh learners) is back after the Summer break. It will be held once a month on the third Monday evening of the month. Our next meeting will be held on Monday, November 19, 2018 at 7 pm. The next Awr Sgwrsio (not the learners’ group) will be held Monday, November 5, 2018. 422 MacKay St at Beechwood. Good food, good conversation and of course, the usual quiz! Our next meeting will be held on Monday, October 15, 2018 at 7 pm. RSVP to Alison Lawson at alisonlawson@rogers.com. The Ottawa Welsh Society’s Awr Sgwrsio i Ddysgwyr (conversation group for Welsh learners) is returning after the Summer break. It will be held once a month on the third Monday evening of the month. Our next meeting will be held on Monday, September 17, 2018 at 7 pm. Please let us know whether you are interested in joining the group, and whether you plan to attend on September 17. The Ottawa Welsh Society has started an Awr Sgwrsio i Ddysgwyr (conversation group for Welsh learners) in January 2018. It will be held once a month on the third Monday evening of the month. Our next meeting will be held on Monday, June 18, 2018 at 7 pm. Please let us know whether you are interested in joining the group, and whether you plan to attend on June 18. The next Awr Sgwrsio (not the learners’ group) will be held Monday, June 4, 2018. It will be hosted by Geraint Lewis. RSVP to Geraint at gwlewis@rogers.com. Our next meeting will be held on Monday, May 21, 2018 at 7 pm. Please note this is the holiday Monday. Our host for this meeting will be John Williams. Please let us know whether you are interested in joining the group, and whether you plan to attend on May 21. Our next meeting will be held on Monday, April 23, 2018 at 7 pm. Please note the change in date. Please let us know whether you are interested in joining the group, and whether you plan to attend on April 23. Our next meeting will be held on Monday, March 19, 2018 at 7 pm. Please let us know whether you are interested in joining the group, and whether you plan to attend on March 19. RSVP by Tuesday, February 27, 2018 to John Price at john.price@sympatico.ca. Please join us to honor our patron saint while enjoying good fellowship and excellent food. Our guest speaker this year is Dr. David Jeanes. Entertainment: We will be entertained by the very talented baritone, Ryan Hofman, who will sing a selection of classical and Welsh songs. Menu: This year we are offering a choice of chicken or vegetarian meal. Cost: Early bird tickets $55 each, deadline February 10, 2018; $60 thereafter. Final deadline for reservations is 22 February 2018. Reservation forms are in the Winter 2018 Newsletter or you can print your own: Luncheon Reservation 2018. Please send your completed forms, with payment, to Marilyn Jenkins, 267 McClellan Road, Nepean, ON, K2H 8N7. If you wish, you may include your 2018 membership form and payment with your luncheon reservation. Our next meeting will be held on Monday, February 19, 2018 at 7 pm. at 449 Mansfield Avenue. Please let us know whether you are interested in joining the group, and whether you plan to attend on February 19. RSVP to Marilyn Jenkins at marilyn.e.jenkins@sympatico.ca. The Ottawa Welsh Society will be starting an Awr Sgwrsio i Ddysgwyr (conversation group for Welsh learners) in January 2018. It will be held once a month on the third Monday evening of the month. Our first meeting will be held on Monday, January 15, 2018 at 7 pm. at 449 Mansfield Avenue. Please let us know whether you are interested in joining such a group, and whether you plan to attend on January 15. Join us as we learn about the experiences of some of our members in emigrating from Wales to Canada. Please note the upcoming annual conference of the British Isles Family History Society of Greater Ottawa (BIFHSGO). The conference themes are English and Welsh Family History, and Research Methodology. One of our OWS board members, David Jeanes, will be presenting a talk. The dates for the conference are September 29 to October 1, 2017. The conference will be held at Ben Franklin Place, 101 Centrepointe Drive, Ottawa. Here is the link to the conference information. Registration can be done online. 67 Clarence Street, just north of the Parking Building. Our own quizmaster, John Price, has promised another challenging quiz on things Welsh! Please note: Attendees are responsible for their own purchases of food and drink. Cwrs yw hwn ar gyfer ystod eang o ddysgwyr â€“ o’r rhai ag ychydig iawn o Gymraeg neu ddim Cymraeg o gwbl i’r rhai sy’n rhugl ond sydd am wella ansawdd eu Cymraeg llafar ac ysgrifenedig. Mae’r cwrs yn rhedeg am 4 wythnos ond mae croeso ichi fynychu wythnos neu ddwy os bydd hynny’n fwy cyfleus. This is a course for learners with little or no knowledge of Welsh up to those who are fluent but want to improve the accuracy of their spoken and written skills. The Course runs for 4 weeks but you are welcome to attend for a week or two if this is more convenient. Maeâ€™r cwrs Cymraeg Proffesiynol yn gyfle gwych i siaradwyr rhugl wella eu sgiliau ysgrifennu a chyfathrebu yn y Gymraeg, yn ogystal Ã¢ magu eu hyder wrth ddefnyddioâ€™r Gymraeg yn y gwaith neu yn y gymuned. Our Professional Welsh Course is a great opportunity for fluent Welsh speakers to improve their Welsh writing and communication skills, as well as building their confidence when using Welsh in the workplace or in the community. The Executive have invited Marilyn Jenkins to conduct the Gymanfa. Marilyn conducted the Ottawa Welsh Choral Society for 24 years, leading it to success in the Kiwanis Music Festival and on a well-received tour of Wales in 1990, and on many other adventures. She also taught music to intermediate level students for 33 years, before retiring to pursue other interests more fully. These interests include American Sign Language, voice training, quilting and dressage. She looks forward to encouraging the congregation to sing with gusto and sensitivity. Alan Thomas will once again be at the organ, supporting the singing with his inimitable accompaniments. He is always an enjoyable addition to any Gymanfa. Alan will also be leading the Côr Alltudion Westminster, a pick-up choir, in a version of the beloved hymn, Llef. Please bring your Welsh Hymn Book, if you have one! View the program here: gymanfa-2017-program. Feel free to print a copy to bring with you. Please join us to honor our patron saint while enjoying good fellowship and excellent food. Our guest speaker this year is Phil Jenkins, well-known local author, journalist and historian. Entertainment: Recital by soprano soloist Ania Hejnar, accompanied by well-known Ottawa accompanist, Judith Ginsberg. Cost: Early bird tickets $55 each, deadline February 11, 2017; $60 thereafter. Reservation forms are in the Winter 2017 Newsletter or you can print your own: Luncheon Reservation 2017. Please send your completed forms, with payment, to Marilyn Jenkins, 267 McClellan Road, Nepean, ON, K2H 8N7. If you wish, you may include your 2017 membership form and payment with your luncheon reservation. Tickets are $20 and must be reserved by November 1, 2016. Payment will be collected at the door. Performances by two choirs: The Celtic Choir and Côr Alltudion, with songs in Welsh and Spanish. A demonstration of the tango by two professional dancers. Mae’n amser i dechrau sgwrsio! Bydd na Awr Sgwrsio Nos Lun, Hydref 3, 2016 yn y Clock Tower, Bank St. am saith o’r gloch. Cewch hefyd ddod am 6 o’r gloch i gael pryd. Danfonwch nodyn i mi os yr ydych yn bwriadu dod. Hefyd, y mis canlynol, Tachwedd 7, ‘rydym am gael noson ffilm yn nhŷ John Williams i weld ‘Y Gwyll’ yn Nghymraeg. Danfonaf manylion mis nesaf. It’s time to start chatting! We will be having ‘Awr Sgwrsio’ at the Clock Tower Pub, 575 Bank Street, Monday, October 3, 2016 at seven o’clock. You can also join us for a meal at 6 p.m., if you wish. Please let me know if you plan to join us. We are planning a film night the following month, November 7. It will be held in John Williams’ home and we will be lucky enough to see another all-Welsh episode of ‘Y Gwyll’. Mark it on your calendars – I’ll send you the details next month. On September 28, 2016, a new exhibition entitled Open Books: International Artists Explore the Chinese Folding Book will open at The Library and Archives Canada at 395 Wellington. The opening starts at 5:30pm. This cross-cultural exhibition explores the Chinese folding book as used by modern visual artists from the West and China in a unique take on a traditional medium. The Canadian exhibition introduces new and original works by Canadian artists and showcases past works by international artists. This venture was begun in Wales by a Welsh Co-curator and part of the exhibit includes an artist from Wales. The following information appears on the Library and Archives Canada web site. Pob mis Awst rydym yn cynnal Cwrs Dwys Haf sef cwrs ar gyfer pobl sydd â diddordeb dysgu Cymraeg. Mae’n gwrs poblogaidd iawn gyda phobl o bob cwr o’r byd yn dod atom. Mae gwahanol lefelau ar gael o ddechreuwyr pur i lefelau hyfedredd. Gellir mynychu’r cwrs am wythnos yn unig, neu bythefnos, tair wythnos neu’r mis cyfan. Rydym hefyd yn darparu llety ar gyfer hyd y cwrs yn ein neuaddau Prifysgol gyda dewis o ystafelloedd en-suite a dim en-suite. Dyma linc i fwy o fanylion am y Cwrs Dwys Haf. Every August we hold an Intensive Summer Course, which is a course for people who want to learn Welsh. It’s a very popular course with people from all over the world attending. Different levels are offered, from complete beginners to Advanced levels, something to suit everyone! It’s possible to attend the course for a week, two weeks, three weeks or for all four weeks. We do offer accommodation for the duration of the course in our University Halls with a choice of en suite and non en suite rooms. Here is a link to further information about the Intensive Summer Course. Welsh Heritage Week 2016 is an annual week of immersion in Welsh language and culture. It is a week-long course on everything Welsh, including: language lessons, folk dancing, clogging, hymn singing, harp lessons, Welsh literature, and so much more. Sponsored by the Welsh Harp & Heritage Society of North America, Inc.
Info: Contact Beth Landmesser, hwyl@ptd.net or 570-814-7689. We have just learned that there will be a rugby match between the Ottawa Indians and the Welsh Rhydywaun U16 team. (Rhydywaun is located between Aberdare and Glyn Neath.) This match is for under 16, i.e. school age. Should be fun. According to the referee, “they always put on a good game”. The date is Friday, July 15th, time 6:30 p.m.
Rugby enthusiasts are encouraged to head out to Twin Elm Rugby Park in North Gower (on Twin Elm Road near Barnsdale) on Friday. The venue appears to have plenty of seating under cover. Even if you don’t know anything about rugby, it should be a fun event for Ottawans and Welsh ex-pats alike. So if you have nothing planned, head on over. Congratulations to Wales for their 3-1 win over Belgium in their quarter-final game! We will play Portugal in the semi-final game. Come to the Georgetown Pub at 1159 Bank Street, south of Sunnyside to watch the game. Wednesday, July 6. Kick-off is at 3:00 pm. Wales has reached the quarter-final stage and will be playing Belgium next. Friday, July 1. Kick-off is at 3:00 pm. Bring your colours! Come for supper at 5:30 pm and stay for the meeting. Let’s all celebrate! The Ontario Welsh Festival is going to be in Ottawa April 22-24, 2016 and the Ottawa Welsh community is going to enjoy a feast of music. The festival is an annual celebration of Welsh music and culture, drawing visitors from all over Canada, the United States and Wales. First held in Niagara Falls in 1961, the festival has travelled throughout the province from Ottawa to Windsor since then. This year it is our turn. The highlight of the Festival will be a concert by Côrdydd, a prize winning mixed voice choir from Cardiff, Wales, together with extra-special guests, the world renowned Three Welsh Tenors, on Saturday, April 23. It is going to be a feast of music. The choir’s name is a play on the word “Caerdydd”- the Welsh for Cardiff, the capital city from which they hail. The choir was founded in 2000, and over the years has grown from strength to strength. Côrdydd have won the Choir of the Festival award at the National Eisteddfod more than any other choir, four times in all – Cardiff in 2008, Wrexham in 2011, The Vale of Glamorgan in 2012 and Denbigh in 2013. They are the backing choir on most of the tracks on Bryn Terfel’s Christmas CD. The Three Welsh Tenors, Aled Hall, Rhys Meirion and Aled Wyn Davies are fantastic. Their repertoire combines classics from opera and musicals, famous Welsh songs and hymns, and contemporary compositions – a mixture to suit everyone. The concert will be held at Dominion Chalmers United Church, 355 Cooper St. Tickets are $25 in advance, $30 at the door. If you are interested in buying some, you can get them from Book Bazaar 417 Bank St, Granata Music 1568 Merivale Rd, The Leading Note 370 Elgin St or from Myfanwy Davies at 613-526-3019. The other highlight of the Festival will be traditional hymn singing sessions, known in Welsh as a “Gymanfa Ganu,” at Dominion Chalmers on Sunday, April 24. The public is invited, and if you have never heard the Welsh sing hymns in four-part harmony, don’t miss this opportunity to experience it and join in. There will be two sessions, one at 10.30 a.m. and one at 1.30 p.m. An added treat will be songs by Côrdydd and the Tenors during each session. There will be a free-will offering. Bydd na Awr Sgwrsio Nos Lun, Ebrill 4, yn y Clock Tower, Bank St. am saith o’r gloch. Cewch hefyd ddod am 6 o’r gloch am pryd. Danfonwch nodyn i mi os yr ydych yn bwriadu dod. We will be having ‘Awr Sgwrsio’ at the Clock Tower Pub, 575 Bank Street, Monday, April 4 at seven o’clock. You can also join us for a meal at 6 p.m., if you wish. Please let me know if you plan to join us. Please join us to honor our patron saint while enjoying good fellowship and excellent food. Our guest speaker this year is OWS member Pawl Birt, long-time Professor of Celtic Studies at the University of Ottawa and a recognized expert on the Welsh colony (Y Wladfa) in Patagonia..
We are really delighted to welcome Merched Dewi and their director, Betty Cullingworth, all the way from Toronto, who will delight and entertain us with a selection of Welsh songs. Merched Dewi (“St. David’s Ladies”) is a group that sings a wide range of traditional and modern Welsh music yn Gymraeg (“in Welsh”). Please come and show them how much we appreciate them making the effort to come here! Menu: This year we are offering a choice of herb-crusted chicken or portobello stack. Cost: $55; Early bird tickets $49 each, deadline February 19, 2016. We are pleased that Betty Cullingworth of Dewi Sant Church in Toronto will be serving as our Gymanfa director this year. Betty is the beloved director of the Merched Dewi choir and a long-time contributor, in many capacities, to the Ontario Welsh Festival events. The irrepressible Alan Thomas will once again be accompanying the singing on the organ and special music will be provided by OWS members. Please bring your Welsh Hymn Book, if you have one! View the program here: Gymanfa 2016 program. Feel free to print a copy to bring with you. Once again Alan Thomas has kindly agreed to direct an ad hoc choir to perform in the service. This year the choir will present two carols. Please consider taking part and contact Bob Price at robertprice@magma.ca if you wish to participate indicating, as well, your preferred section: SATB. Doors open at 3:30pm, Music at 4pm. “Emerald Shores”, by Susan Toman, will be officially launched on Saturday Nov.21st at 4pm. The album consists of Dances and Airs from Ireland and Scotland, all traditional music, and all original arrangements which are based on current techniques and playing styles abroad. Susan is a professional Celtic harpist here in Ottawa and did her training in Ireland. She will perform the pieces on the album, with some commentary in between each, and will demonstrate some of the techniques used in the arrangements. Doors will open at 5.30p.m. Adults: $20; Children: age 5 – 12 $5, under 5 free. The deadline for ordering tickets is Tuesday, November 3rd, 2015. ! There will be no ticket sales at the door. This is a very popular event so order your tickets now. Please let us know of any food issues/allergies. We will need people to take part in the Noson Lawen. Singing, playing an instrument, poetry reading, dancing, jokes, stories – all are welcome. Please contact Alan Thomas at alan.thomas@sympatico.ca if you are interested in taking part in plenty of time, so we can set up an interesting programme for everyone! We will also need some physical help – volunteers to help in the kitchen, setting up, taking down at the end (this is really important!!). Please let Wendy know if you can put your strength and skills at our disposal! Our Pub Night and Quiz will be on 22 September at the Heart and Crown in the Byward Market, Peter Devine Room, 73 Clarence Street, starting with dinner at 6:00 and moving on to a quiz later. Persons attending are responsible for their own food and drink. CelticMTL2015 is a convention to promote and educate the population about the Celtic Nations. Some people have a habit of defining Celtic to be an Irish term. However, the Celts also include the Cornish (Cornwall, UK), the Manx (Isle of Man, UK), the Bretons (Brittany, France), the Welsh (Wales, UK), the Scottish (Scotland), and the Galicians (Galicia, Spain). This convention will have numerous Celtic societies and organizations who will be present to showcase their heritage and introduce themselves to people who are interested in learning more about their Celtic background or even Celtic culture in general. The convention will be taking place in the downtown campus of Concordia University both in the EV and John Molson School of Business building. There will also be demonstrations of song, dance, literature, and culture during the course of the day in the BMO theater room located inside the JMSB building. We will have associations from across the country who will attend this event to proudly represent their Celtic Societies. Come out for this historical event where you will have the chance to meet the entire Celtic Nation in one giant setting! You might be surprised what you learn and or discover about your own background. We invite the Ottawa Welsh community to join us in beautiful Niagara Falls for a very special weekend celebrating our Welsh heritage and culture. We are returning to the lovely Marriott Gateway on the Falls Hotel where we have the same fantastic hotel rates as last year- $125 city view, and $145 Fallsview per night, double occupancy. Please note that the deadline for reserving at these rates is MARCH 24.Why don’t you call to reserve your room right now directly with the hotel at 1-905-374-1077 or toll free at 1-800-618-9059. We are thrilled to welcome our 2015 Guest Choir, Côr Rhuthun, a mixed voice choir from Denbighshire, North Wales under the leadership of the renowned Welsh composer, Robat Arwyn, with accompanist Mair Jones and soloists Kate Griffiths and Meirion Wyn Jones. This concert is going to be a musical delight. The choir won the main competition for mixed choirs in the National Eisteddfod six times and their soloists are also National Eisteddfod winners. The choir has made many appearances on television and radio over the years. They have also released 7 recordings. To top it all, they are directed by Robat Arwyn, who is a legend in Wales. I’m sure everyone will recognize the names of his songs, such as Yfory, Gwin Beaujolais, Benedictus (a duet arrangement sung by Bryn Terfel and Rhys Meirion), Atgof o’r Sêr and Brenin y Ser. alisonlawson@rogers.com or phone Alison Lawson at 613-725-2704. Toronto Welsh Male Voice Choir coming to town! The Ottawa Celtic Choir is pleased to announce that they will be presenting a joint concert with the Toronto Welsh Male Voice Choir. Time: Concert starts at 7:30 pm, doors open at 7 pm. This promises to be an excellent event. Please come and support it. For further details, contact Ellen MacIsaac at ellen@laughingbrook.ca.ca or by phone at 613-552-3964. Please join us to honor our patron saint while enjoying good fellowship and excellent food. Our guest speaker will be Melanie Courtmanche, a Francophone graduate in Celtic Studies (primarily Welsh) of the University of Ottawa. She received a Master’s degree for a thesis on Welsh poet/artist David Jones. Melanie has also travelled and studied in Wales. This will be followed by a short recital by the Ottawa Choral Society Ensemble who will delight us with a variety of songs. The OCS Ensemble is a fund-raising venture of the Ottawa Choral Society, one of Canada’s prominent symphonic choruses. Small ensembles of 8-20 choristers sing for various special events. I am sure you will recognise three Cymraes in the group. Cost: $49 each, before February 13th, $55 each thereafter. We are delighted that Alan Thomas will be our conductor and Deirdre Piper will accompany us on the organ. There will also be solo spots, including the Côr Alltudion Westminster, back by popular demand. Please bring your Welsh Hymn Book, if you have one! View the programme here: St David’s Day Gymanfa 2015. Feel free to print a copy to bring with you. 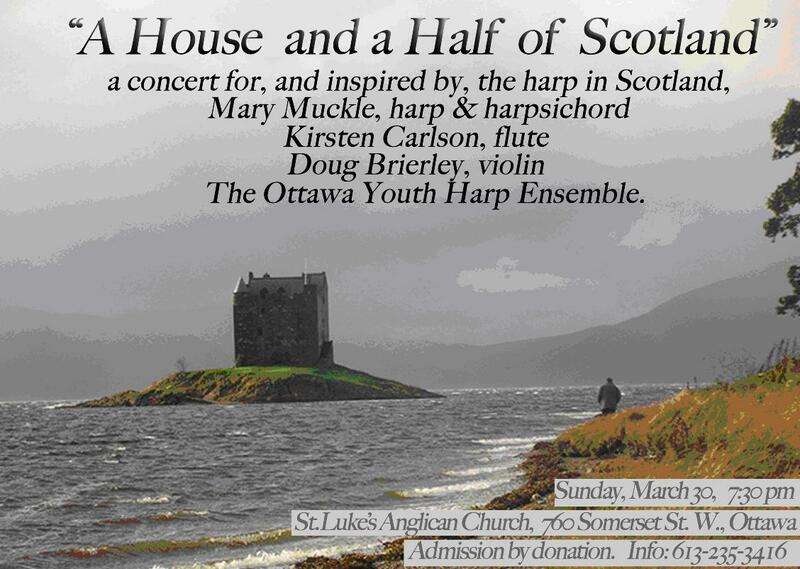 Mary Muckle and her talented associates will present a concert on Sunday, March 1, at 8pm, St. Luke’s Anglican Church, 766 Somerset St. W.
With the Ottawa Youth Harp Ensemble and a special guest appearance by Cantorion Cerdd Dant. For further information, please contact mucklerice@rogers.com or 613-825-1379. Alan Thomas will once again accompany on the organ and will reprise the pick-up choir from last year. Anyone who is interested in joining this group should contact Bob Price at robertprice@magma.ca . As always, the service will be followed by a Te bach. Donations of treats are always welcome: please drop them at the kitchen prior to the service. We look forward to a large turnout to help us celebrate Christmas in the Welsh language. This is a very popular event so order your tickets now! There will be no ticket sales at the door. The deadline for ordering tickets is Wednesday, November 19th, 2014. We will also need some physical help – volunteers to help in the kitchen, setting up, taking down at the end (this is really important!!). Please let Wendy know if you can put your strength and skills at our disposal. With the centenary of the birth of Dylan Thomas rapidly approaching, the Chair of Celtic Studies at the University of Ottawa in conjunction with the British Council (Cardiff and Toronto) are proud to announce that we have been given permission to screen the new film version of Under Milk Wood (Dylan Thomas’ famous radio play from 1954). Whereas the well-known film version from 1972 had Richard Burton in the leading role as the ‘voice’, this new version has Rhys Ifan, well-known for many roles in the last decade. Free Entry. There are approximately 60 seats in the room, so it will be on a first come, first served basis. be very helpful if you could let me know. Please join members of the executive for supper and/or drinks, starting at 7:00 p.m. in the “Old Kitchen”. 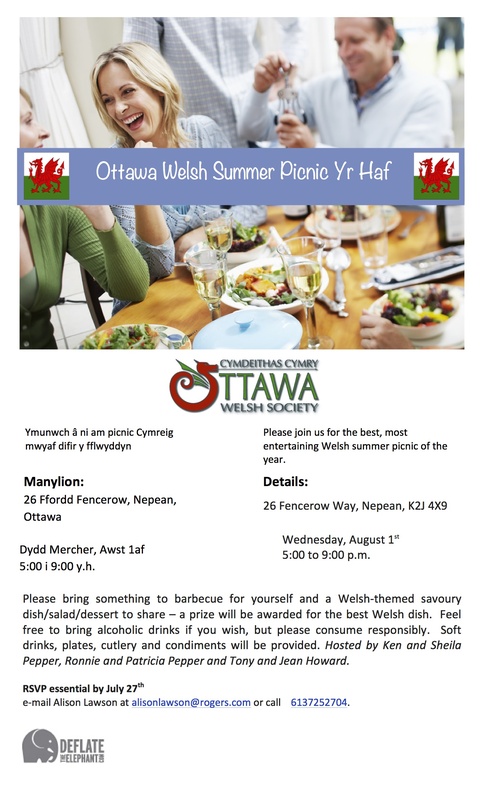 No reservation necessary, just show up ready to share a pleasant evening with friends in the Ottawa Welsh Society. Our quiz master has promised to include some questions we can all have a go at! Celtic Studies at the University of Ottawa is pleased to announce that Colin Williams from Cardiff University will be taking part in an informal round table at the University on Wednesday, 4th June at 7pm in the ARTS Building room 215. The round table will informally discuss the future of the Welsh language. As many will know already, Prof Colin Williams has been a central figure in Wales regarding language planning and the development of language policies. He is well-known internationally and is the author of many books on the subject of language promotion. He has taken the Canadian experience as a useful guide in the development and study of language. All those interested in the future of Welsh are cordially invited to this informal meeting with Colin. Come and enjoy a meal with your friends at 5.30. The meeting will commence at 7 p.m. The committee has worked very hard over the past year on behalf of the Society. Please come out to show your support for us! contact John Price at 613-724-3846 or e-mail at john.price@sympatico.ca. a luncheon banquet in the gracious surroundings of the Royal Ottawa Golf Club. and Shirley Griffiths and a journalist of international repute. She is sure to have some very interesting things to tell us. Cost: Early bird tickets $49 each, until February 15th, $55 each thereafter. The conductor this year will be Marilyn Jenkins. View the programme here: St David’s Day Gymanfa 2014. Feel free to print a copy to bring with you. Cost: Members – $10, Non-Members – $15, Students – $5, Children under 12 years of age – free. We are trying a new time to appeal to more members. Please note in your planner: 3:00 p.m. The location will be the same: Westminster Presbyterian. The event will be led by Rev. Neil Wallace and members of the OWS will read the various lessons in English, French or Welsh. Hymns have been selected by president John Price. Alan Thomas will once again accompany on the organ and will reprise the pick-up choir from last year in a new carol: Jwdea. Anyone who is interested in joining this group should contact Bob Price at robertprice@magma.ca. Also joining us again this year will be the lovely voices of the Power/Evans family. Doors open at 5:30 p.m. — Dinner at 6:30 p.m. This is a very popular event, so DO order your tickets now! We will need people to take part in the Noson Lawen. Singing, playing an instrument, poetry reading, dancing, jokes, stories – all are welcome. Please let Wendy know if you are interested in taking part in plenty of time, so we can set up an interesting programme for everyone! Please join members of the executive for supper and/or drinks, starting at 7:00 pm in the “Peter Devine Room”. No reservation necessary, just show up ready to share a pleasant evening with friends in the Ottawa Welsh community. Our gallant leader, John Price, is preparing a challenging QUIZ so come and enjoy the fun. If you don’t like driving downtown, why not come on the bus to the Rideau Centre – the pub is a five-minute walk from the back of The Bay. cynorthwyo i dafarn Y Clock Tower, Bank St., Nos Lun, Medi 30fed am saith o’r gloch. We will be having ‘Awr Sgwrsio’ at the Clock Tower Pub, 575 Bank Street, Monday, September 30th at seven o’clock. Please join us. The Pontarddulais Male Choir will appear in Ottawa for one night only on Friday, September 6, 2013. Their concert will take place at City View United Church, 6 Epworth Avenue, Nepean starting at 7:30 p.m. This award-winning choir was started in 1960 and has taken first place at the National Eisteddfod of Wales a record 15 times, and has also won the Llangollen International Musical Eisteddfod top prize twice. Their last visit to Ottawa was in 1977 and it will be lovely to hear them again. They sing a wide repertoire of songs and styles ranging from Welsh folk and sacred songs, to operatic choruses to modern show tunes. Please join us for the best Welsh summer picnic of the year. Please bring something to barbecue for yourself, something to drink and a savoury dish/salad/dessert to share-if you can make a Welsh-themed dish, all the better-a prize will be awarded for the best Welsh dish. Feel free to bring alcoholic drinks, if you wish, but please consume responsibly. Please bring a garden chair. Plates, plastic cutlery and condiments will be provided. Hosted by Laurie Jenkins and Rob Woods, and Ronnie and Patricia Pepper. Where: bar/restaurant -The National Hotel, 361 Queen St, Ottawa (formerly the Delta Hotel and Suites). We will meet in the bar for drinks and conversation and hopefully a few rounds of Sosban fach. Parking is available at the hotel ($7), a lot on the corner of Bay & Queen Sts, or at metered parking street-side. We look forward to seeing you there. Hwyl. Dewch i gael sgwrs yn yr Awr Sgwrsio, Nos Lun, Mehefin 24, 2013 yn y Clock Tower, 575 Bank St. am saith o’r gloch. Cawn penderfynu bryd hynny os ‘rydym am cwrdd yn Gorffenaf. Come for a chat in Welsh at ‘Awr Sgwrsio’ at the Clock Tower Pub, 575 Bank Street, Monday, June 24th, 2013 at seven o’clock. We will decide whether to meet in July when we see each other on Monday. Lun, Mai 27fed am saith o’r gloch. Monday, May 27th. at seven o’clock. Come and enjoy a meal with your friends at 5:30. The meeting will commence at 7 pm. Kelly Aminian & Kahlan Miron, harps and Doug Brierley, violin. Tickets $12 general and $10 Seniors & Students are available at The Leading Note, 370 Elgin St.; The Folklore Centre, 1111 Bank St.; Granata Music, 1558 Merivale Rd. and at the door. As part of this year’s St David’s Day celebrations, we are organizing an International Evening of Welsh Poetry which will showcase the vast range of modern Welsh poetry written in English, Welsh and Spanish. With the help of readers and translators we will show how Wales’ foremost art form knows no geographic or imagined boundaries, whether it is written or read in Wales or Argentina; Canada or Hungary. Students from the Celtic Studies program at the University of Ottawa will also take part. Would you like to read a well-known Welsh poem, or just need more information? If so, contact: Pawl W. Birt at pwbirt@uottawa.ca or 613-562-5800 ext 3767. Date/Time: Sunday, March 3rd, 2013 at 3p.m. Location: Westminster Presbyterian Church, 470 Roosevelt Ave.
Last year’s Gymanfa was a resounding success. Please join us again to sing some wonderful hymns in English and in Welsh. We are delighted that Roy Morris will be our conductor this year, and Alan Thomas has generously agreed to accompany us on the organ. Please bring your Welsh hymn book, if you have one. something to nibble with their tea or coffee. Please come and join us in this traditional Welsh choral celebration. We will once again have the pleasure of celebrating Dydd Gwyl Dewi Sant/ St David’s Day with a luncheon banquet in the gracious surroundings of the Royal Ottawa Golf Club. Please join us to honor our patron saint while enjoying good fellowship and excellent food. We will then have the pleasure of an address by Corin Robertson, Acting British High Commissioner to Canada. This will be followed by a short recital by Chris Oliveira, a young tenor soloist with a great voice. He will be accompanied by Alan Thomas. Cost: Early bird tickets $49 each, deadline February 16th, $55 each thereafter. What a treat for the Welsh community in Ottawa! Merched Dewi, the Welsh women’s choir attached to Dewi Sant Welsh United Church in Toronto, and their director, Betty Cullingworth, came to Ottawa at the end of May and delighted a full house at Westminster Presbyterian Church with a wonderfully varied programme of Welsh music. They were joined for the occasion by four Ottawa `friends`, Maureen Carpenter, Jennifer Davies, Myfanwy Davies and Alison Lawson, who had sung with them on previous occasions in Toronto, Kingston and Wales. After being welcomed by our President, Dr Pawl Birt, the choir proceeded to sing a programme of modern pieces, traditional folk songs, hymns and anthems, entirely in Welsh. It was enough to bring a tear of `hiraeth` to many eyes. As if this wasn’t enough of a treat, the choir was joined by three talented soloists : John Griffiths, well known to Ottawa Welsh Society members for his wonderful singing, Carole Porterlance who sang two lovely songs in impeccable Welsh, and Meriel Simpson ofToronto, who joined John in a Welsh rendition of Panis Angelicus. The audience was also privileged to hear an instrumental trio, Mary Muckle(harp), Kirsten Carlson(flute and Loyda Lastra(flute) play a beautiful medley of Welsh folk tunes. Alan Thomas accompanied throughout with his usual professional expertise. All in all, it was a very special occasion for the Ottawa Welsh community. Many thanks to all the people who helped make the concert possible including the singers, soloists, Alan, Westminster Presbyterian Church, those responsible for providing the `te bach`, front of house volunteers, publicity people and anyone else I might have left out inadvertently. Please come back toOttawasoon, Merched! FAGGOTS AND PEAS AND NOSON LAWEN October 23rd 2010. The Faggots and Peas night is a very popular event among the Ottawa Welsh community and this year was no exception. Over a hundred people gathered at Westminster Presbyterian Church to enjoy a delicious meal and to take part in the fun of a Noson Lawen. John Griffiths’ faggots and peas were fantastic, the mushy peas and gravy prepared by Jean Howard were superb, and the potatoes, peeled and cooked by Myfanwy Davies and Gaye Brittle and mashed by Haleigh were a big hit. The apple pie and ice cream provided by John Price was a perfect way to finish off the meal. After the meal, we were all very proud to honour Stan Hughes, who was recently awarded the Order of Canada, with a special commemorative plaque presented by Dr. Pawl Birt. We then enjoyed varied entertainment in the true spirit of a Noson Lawen. We were especially pleased to welcome the Ottawa Celtic Choir who sang two pieces in Welsh. We finished off with a sing song of popular Welsh songs, ably accompanied by Alan Thomas who also MC’ed the event. The committee would like to give a huge round of applause to everyone who helped to make this event such a success. It wouldn’t be possible without the cooks and kitchen crew, the bar organiser and staff, the set up crew, the table layers, the hall decorators, the public address system techie, the servers, the raffle ticket sellers, the washer-uppers (these included the whole Bello family), the M.C., the ticket order taker, the treasurer and the door staff –a big THANK YOU to you all! The Ottawa Welsh community celebrated St David’s Day/Gwyl Dewi Sant in style with a number of wonderful events. The luncheon banquet, held on Saturday, February 27th, was acclaimed by all who attended as highly successful (see photographs below). It was held in the gracious Royal Ottawa Golf Club, where a delicious meal was served of traditional leak and potato soup, roast lamb and a most artistically served dessert of mixed sorbets and meringue. Our Master of Ceremonies, Myfanwy Davies, kept us entertained throughout the meal with greetings from various Welsh groups around the world, and in between, we all worked hard at answering a quiz on Wales, prepared by Myfanwy: So, who is the Welsh author who writes stories about horse racing? Our guest speaker, Dr Elwyn Griffiths, who was accompanied by his lovely wife, Carys, regaled us with a very entertaining account of ‘y Cymro oddi cartref,’ the travels of a Welshman over his lifetime away from home. We were then entertained by a lovely programme of songs sung by local soprano, Shawne Elizabeth, ably accompanied by our own Alan Thomas. Shawne had taken the trouble to learn some songs in Welsh especially for this event and we all really appreciated her hard work. Our annual Gymanfa Ganu was held on Sunday, February 28th at Westminster Presbyterian Church. Alan Thomas led us through the hymns, encouraging us to sing our best. The result was a very pleasing sound, especially when we sang a capella. Our accompanist on the organ, Deidre Piper, did a wonderful job of keeping up with Alan’s brisk tempo! Our three soloist, John Griffiths, Shannon Mercer and Duncan Schuthe, delighted us with some beautiful songs and we are very grateful to them for taking part in this event. It was especially poignant for many of the long-standing members of the society when John and Shannon sang Bara Angylion Duw (Panis Angelicus) as a duet as we remember them doing this when Shannon was a young girl. We were very grateful to Reverend William Ball for officiating at the Gymanfa and for joining in the singing with gusto. None of these events would have taken place without many hours of work and preparation by the committee – please accept our thanks. The final event of this wonderful weekend of celebration was a reception on Monday, March 1st, at the British High Commission, co-hosted by Anthony Cary, British High Commissioner, and the Wales North America Business Chamber. It was attended by a wide range of people interested in Wales. Delicious cawl, Welsh cakes and bara brith, prepared by staff at the High Commission, was served. It was a most enjoyable evening and the Ottawa Welsh Society is very grateful to the High Commission.